We have to understand few concepts such as Mean and Variance before understand the Standard Deviation. To understand these concepts better, we are taking some example data here. For example, We have 5 items and their Price values are 10, 25, 30, 67, 92. 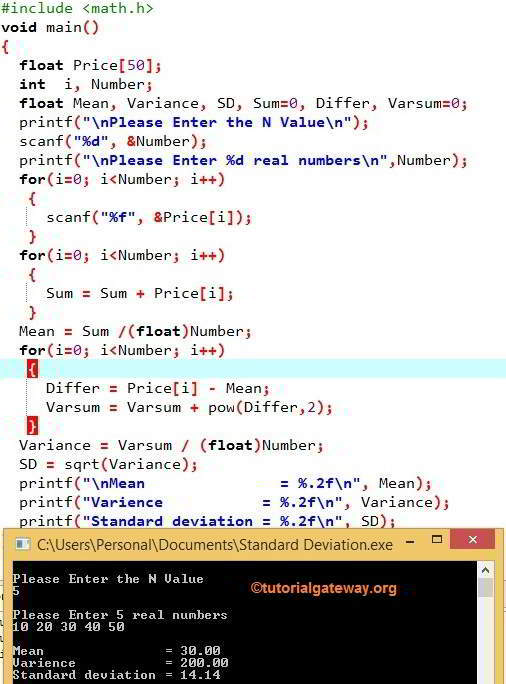 Let us calculate the Mean, Variance and Standard Deviation in C programming. The Square root of Variance is called as Standard Deviation. In this article, we will show you, How to write a C Program to Calculate Standard Deviation, Mean and variance with an example. This C program calculate the Mean, Variance and Standard Deviation of the array of given numbers. The scanf statement will assign the user input values to Price array. So the first value will be assigned to Price, second at Price etc. Since the Number is an integer value and Mean is float value, we have to type cast the Number value to float (i.e (float)Number). If you forgot to Type cast then it will give wrong values. Within the for loop, pow() is the math function which will calculate the power of Differ by 2 times (Equal to Differ2). This C program calculate the Mean, Variance and Standard Deviation of the given numbers in an array using Functions. We have already seen in the above example, there are a lot of for loops and lot of calculation. It is often confusing to put it all together so, in this program we separated the calculation using Function concept. For better understanding, we used the same arguments in the function declaration and Function Calling. In real time, names may change but the data types should be the same. To understand the Functions, it’s better to revise Function article in our Blog: Functions.